Anoola ivory jacquard long coat and dress. Features edge to edge long coat in ivory jacquard. Dress has lace illusion sleeves and neckline with raised satin collar feature. Pretty satin bow belt to complete the look. A mother of the Bride or Groom outfit that will give confidence and gain admiration. Dressed up by Veromia DU287. Stunning Mother of the Bride or Mother of the Groom two piece coat and dress. The coat is full lace meeting edge to edge at neckline. The dress has a lace overlay to give a slimming silhouette complete with ivory waist band detail. Dressed up by Veromia DU300. Features jacquard embossed pale silver dress in pencil straight shape with chiffon overlay. Flattering scooped neckline with single sleeve and side bow detail. A stunning Mother of the Bride or Mother of the Groom plus size occasion outfit. John Charles 26597 crepe half sleeve beaded bodice pencil dress. A truly feminine and simplistic dress that speaks volumes in style. Beaded lines shape the waist and arms with a delicate diamond design on the bust. John Charles 26592 metallic circle dress. 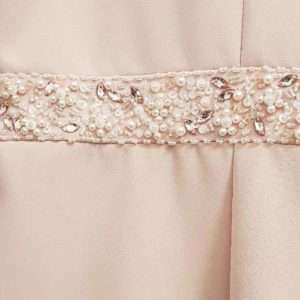 Stunning mother of the bride or groom choice in blush metallic circle fabric. The round on the shoulder neckline is beaded and adorned with crystals. A beautiful dress for the big day.